Iringa was born in Mozambique, Africa, in 1969 and captured before she was two years old. She was sent to the Toronto Zoo in 1974, one of seven elephants shipped to the zoo from Mozambique that year. Iringa was the longest-lived elephant from that group. In 2013, Iringa, Thika and Toka were released to PAWS. All the other elephants, with the exception of Toka, passed by age 41. Toka, who lives at PAWS, is now 45. 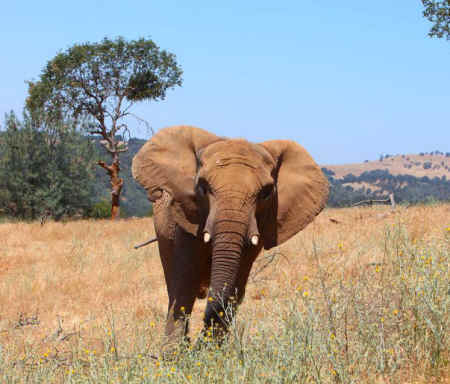 The Performing Animal Welfare Society (PAWS) today announced the death of African elephant Iringa at the ARK 2000 captive wildlife sanctuary in San Andreas, California. She was humanely euthanized on Wednesday, following a long history of degenerative joint and foot disease, the leading reasons for euthanizing elephants in captivity. At age 46, she was among the oldest African elephants in North America. "Iringa was special to us," said PAWS President Ed Stewart. "She enjoyed roaming the hills of the habitat and eating natural vegetation year-round. I'm very proud of the keeper and veterinary care we provided, along with the peaceful life we gave her at our sanctuary." Iringa's favorite time of the day was her therapy pool sessions where she would float in the pool, taking weight off her feet and joints, and eat special treats given to her by her caregivers. After a session, she would immediately go outside and cover herself in mud like an elephant naturally would. Iringa was born in Mozambique, Africa, in 1969 and captured before she was two years old. She was sent to the Toronto Zoo in 1974, one of seven elephants shipped to the zoo from Mozambique that year. Iringa was the longest-lived elephant from that group; all the other elephants, with the exception of Toka, passed by age 41. Toka, who lives at PAWS, is 45. Together with Toka and Thika (born at the Toronto Zoo), Iringa arrived at PAWS in October 2013 after the Toronto City Council voted to relocate the elephants, following the zoo's decision to end its elephant program. "PAWS sends its most heartfelt condolences to the Toronto Zoo staff, the people of Toronto, and to all those who loved Iringa. Along with them, PAWS will miss this very special and dear elephant," said Stewart, who today made a personal phone call to Toronto Zoo CEO John Tracogna to notify him of Iringa's passing. As is customary for all elephants who pass away at PAWS, a necropsy is being performed on Iringa's remains by pathologists at U.C. Davis Veterinary Medical Teaching Hospital.